California Pioneers from left to right: Johnnie Lacy, Joyce Jackson, Donald Galloway, and Bradley Lomax. Original photos by Ken Stein. 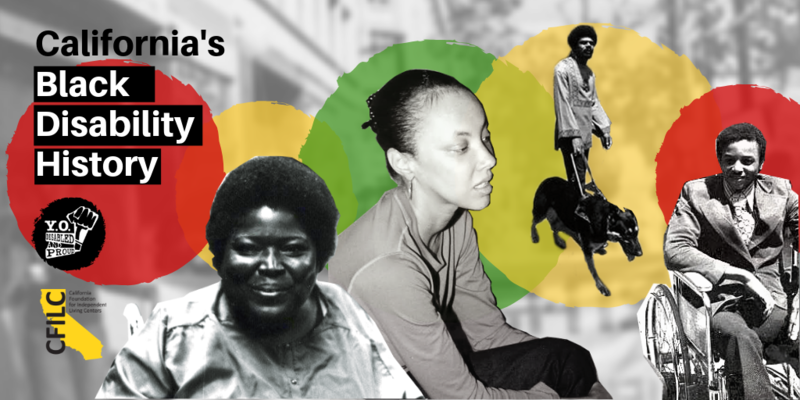 In honor of Black History Month, we at the California Foundation of Independent Living Centers felt that it was only fitting to highlight a few of the Black leaders with disabilities who pioneered the Independent Living Movement. You may remember seeing the photo of Donald Galloway from the 1970s. He’s rocking an afro hairstyle; he’s with his guide dog and Ed Roberts (the Father of the Independent Living Movement) . Johnnie Lacy was a cherished Hayward area community and civil rights advocate and was named Woman of the Year by the California State Senate in 1988. After helping found Center for Independent Living – Berkeley, Ms. Lacy was encouraged to take over the helm at the newly created Community Resources for Independent Living (CRIL) in Hayward where was the Director for over a decade. Recognizing the need for more disability services and supports in his own community, in 1975, Mr. Lomax approached Ed Roberts (who had helped found the Center for Independent Living in Berkeley in 1972), with a proposal to open a Center for Independent Living (CIL) in East Oakland under Black Panther sponsorship. Less than a year later, with Lomax as one of a two-person staff, the East Oakland CIL opened in a storefront, offering basic peer counseling and attendant referral. Ms. Jackson was one of 20 activists sent to Washington, D.C., to meet with Carter administration officials and eventually convinced HEW officials to implement Section 504 – the landmark civil rights legislation prohibiting federally funded agencies, programs, and activities from discriminating against the people with disabilities. For more perspectives on these pioneers in Disability History, visit Ramp Your Voice. Do YOU wanna write for YO! Blog? [Click Here] to pick a topic and let us know!